ITHACA, New York - NASA's Spirit mission may hold the key to proving that life on Mars is not just wishful thinking. The patch of silica-rich soil accidentally uncovered by the rover last year had a major impact on the scientific community, who started asking one question: was that a sign that past life on Mars was ever possible? In a study recently published in the journal Science, a team of researchers led by Frater Steven Squyres (Scorpion, Cornell Univ.) explained that the hot springs, which are believed to have played an important role in forming the silica layer, could indicate possible forms of life. By comparison with Earth, such deposits, usually associated with hot springs and other forms of volcanic activities, contain fossil remains of microbes, Jack Farmer, professor of astrobiology in Arizona State University's School of Earth and Space Exploration, and co-author of the study, explained. However, it remains hard to tell whether that could be the case on Mars, considering that the Spirit rover doesn't carry the adequate instruments to probe that. But, Farmer added, what scientists can say is that this environment, once rich in liquid water and energy needed for life, was at some point a habitable environment. Last year, Frater Squyres said that whether the water came from a hot-spring, similar to a geyser, or from a fumarole in which acidic streams rose through the cracks, the concentration of silica is the most significant discovery by Spirit for revealing a habitable niche that existed on Mars in the past. Scientists still oscillate between the two possible origins of water on Mars, and some even said that the deposits found have a great level of titanium, which is often encountered in Earth's fumarolic deposits, indicating that water may have originated from fumaroles. The Spirit Mission, originally planned for 90 Martian Days of surveillance, has gathered over four years on the Red Planet. The next Martian mission, with the next generation of rover - Phoenix, is expected to prove that life on Mars is not just a myth. 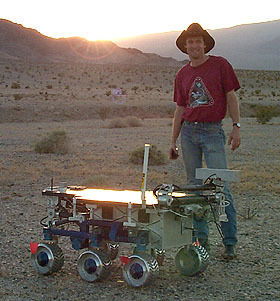 The Mars Rover landed on May 25, in the northernmost point studied to date. Frater Squyres is very excited about the data they could collect from this mission. Adapted from eFluxMedia News Article. If you would like to see your chapter news here, contact Communications Coordinator Tom McAninch.